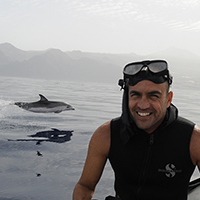 The Canary Islands are one of the best places in the world for viewing marine mammals. 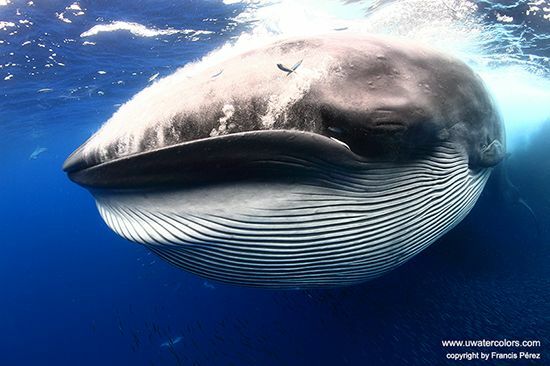 On Tenerife’s south coast there is a permanent population of Pilot Whales and Dolphins, and every year gigantic whales, especially Bryde’s Whales, are seen passing along the coast. Last year (2013) was a very special year with abundant sea life. 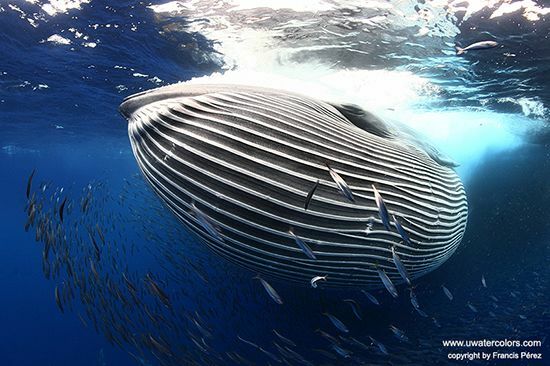 From January to May, the ocean was filled with food for these immense animals, including large schools of Mackerel. 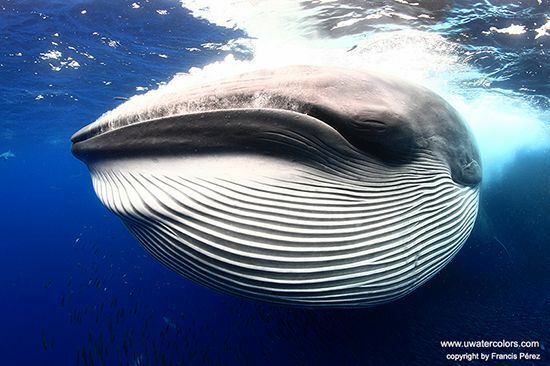 I already had some interesting whale photos taken underwater from the summer of 2012. My objective for 2013 was to photograph the whales while they were feeding. I knew that it would be a very difficult task, having to be in the perfect position at the precise moment. On a miserable, cloudy, windswept day (and what seemed to be the trend of the past few weeks) we were about to turn towards shore when in the distance I spotted a skirmish formed by shearwaters and seagulls battling on the water’s surface, marking the spot where a great feast was taking place. 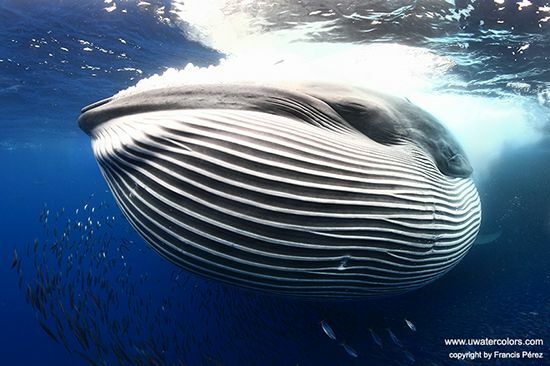 Under the surface, many Spotted Dolphins swimming with Yellowfin & Albacore Tuna, followed by three colossal Bryde’s Whales, were all preparing to attack the immense ball of shimmering silver and blue striped Mackerel. My aim was to photograph one of these giant whales assailing the immense sphere. After several failed attempts to capture the perfect shot, I waited patiently with my camera prepared until my friend at the helm maneuvered the boat to the ideal spot. He placed the boat south of the conflict just as the giant whale made a run for the rotating ball of mackerel. At the precise moment, placed just behind the pending feast, I shot in burst mode to capture as many images as possible of the attacking whale. It was one of the most exciting moments I’ve ever experienced at sea. This type of photography is difficult because you only have a few seconds to capture the perfect moment. Camera settings must be adjusted previously so that you’re ready for the shot. 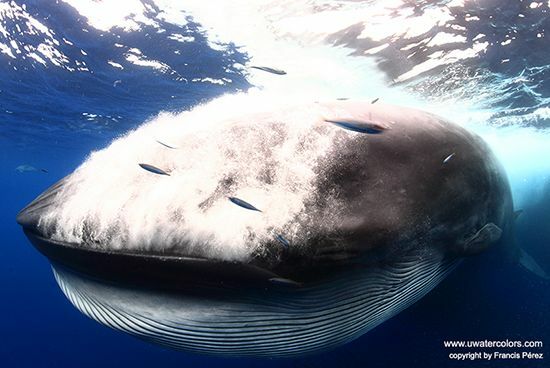 The Bryde's whale surfaces rapidly, so high velocity settings must be used (i.e. fast shutter speed). The very cloudy conditions that day added another challenge, as I had to compensate for the high shutter speed with a high ISO. But for this image sequence luck was on my side, as the whale’s throat is very white, and the photo would likely have been overexposed hadn’t it been for the overcast conditions. 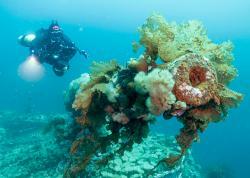 A strobe isn’t advisable to use as it is bulky and impairs streamlined movement in the water. Using no flash also helps avoid irritating the animal. 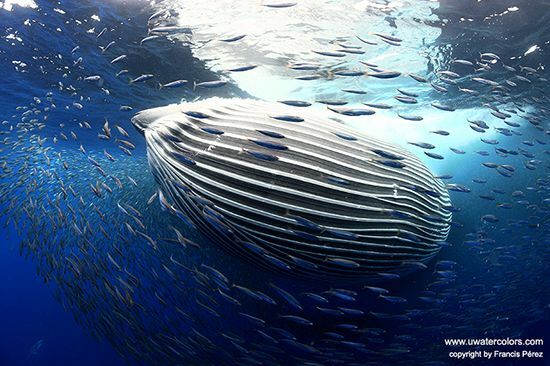 Francis Pérez is an underwater photographer, economist specializing in development economics and lover of marine biology.